I am happy to announce that I am beginning to feel better. Of course the danger in that is I will try to do too much. So while I am still taking it easy....I was able to get a brand new card done for today. My papers are from a two year old Christmas paper pad from Graphic 45. I don't usually reach back like that for papers, but I really liked the green dots. The image is this month's Challenge Image from Designed2Delight. Be sure to head on over there to take a look at her marvelous stamps. 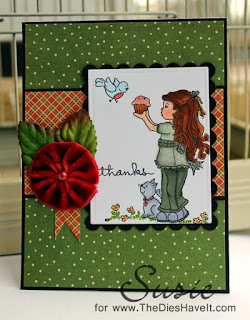 I used Spellbinders dies for my image and mat and then added just a bit of floral loveliness to complete my project. I will be right back here tomorrow with a digital layout for you. I hope I'll see you then. Susie, this is gorgeous ! Love the green/red/orange color combi. The different DP and your layout is great !